Government of India, you know what you did wrong. you caused out twitter account to be blocked now we will show you what anonymous is capable of doing. Greeting government of India, you were bad really bad. One of the worst governments the world has. Yet we tried our best not to go too tough on you, and then you decided to cross over us, bad guys bad idea. We tried to do a slow, non violent protest and government decided to cover out mouths we will not sit idle while our freedom is take away. We will continue our non-violent protest and guess what you will never beat us, ever. 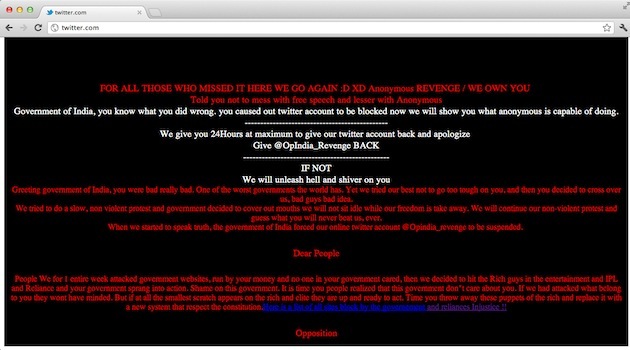 When we started to speak truth, the government of India forced our online twitter account @Opindia_revenge to be suspended. People We for 1 entire week attacked government websites, run by your money and no one in your government cared, then we decided to hit the Rich guys in the entertainment and IPL and Reliance and your government sprang into action. Shame on this government. It is time you people realized that this government don't care about you. If we had attacked what belong to you they wont have minded. But if at all the smallest scratch appears on the rich and elite they are up and ready to act. Time you throw away these puppets of the rich and replace it with a new system that respect the constitution.Here is a list of all sites block by the government and reliance's Injustice !! Don't get ready to jump up and down and make a big show, because we know you are worse that what the word worse can explain. You and the ruling parties share profits in every corruption and then play a drama to fool the people. People realize that they are nothing but the ruling party itself just making mockery of every system that is in place and the people who voted them to power. you guys have no right to act as saviors of people. Expect Us.. You should have. @admin you tried your best to keep us away (even got outside help) but you close a door and we will find 10 more ! !